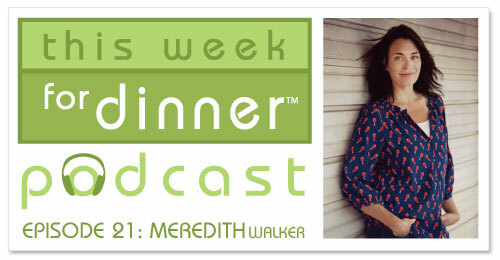 Today’s guest on the show is Meredith Walker. I met Meredith last year when I traveled with her to Malawi with ONE and Heifer International. After a week of truly life-changing travel together we are bonded for life! In addition to Meredith being completely lovable and someone I can laugh with for hours on end, she is also the co-founder and executive director of Amy Poehler’s Smart Girls, a website that Meredith started with her best friend Amy Poehler with the goal to empower girls. Previous to Smart Girls Meredith worked as the head of the talent department at Saturday Night Live, where she booked the guests and pretty much met everyone. Meredith began her career in television, however, working under the tutelage of respected journalist Linda Ellerbee on Nick News. The show won a Peabody and several Emmys while Meredith produced there, but the best part of her job at Nickelodeon was interviewing kids all over the country with interesting stories to tell, creating the foundation for her interest in the lives of young people. Meredith is the best and I feel lucky to count her as a friend. I am so happy she hung out with me on the podcast, especially since she was so pumped to share her favorite recipe with us all, as well as a few kitchen tips! Chop the onions very thin. Put the butter and oil in a stock pot on medium low heat. Add the onions and thyme, and cook them down until translucent, about 10 minutes. Add the wine and cook for 10 more minutes. Add the chicken stock, and let simmer on low until the liquid concentrates- about 20 minutes to 3 hours- the longer it simmers, the better it gets. You want it to be a somewhat thick soup consistency. While the soup is cooking down, combine all of the meatball ingredients in a bowl. Then form the meat into meatballs, a little larger than a golf ball. They might be a little wet, but they should stick together well enough to form. Heat some olive oil in a cast iron skillet on medium-high heat. Fry the meatballs on all sides until they have crispy edges and are cooked through- about 5 minutes per side. When they are cooked, but them in the pot with the onions and let them simmer for about 5 minutes. Transfer about half of the contents of the pot with the meatballs into a casserole dish. There should be liquid underneath and between the meatballs, and the onions as well. Cut up slices of sourdough bread. Grill or toast bread with a little olive oil on it. Put it on top of the meatballs. Then top with the cheeses and garlic chives. 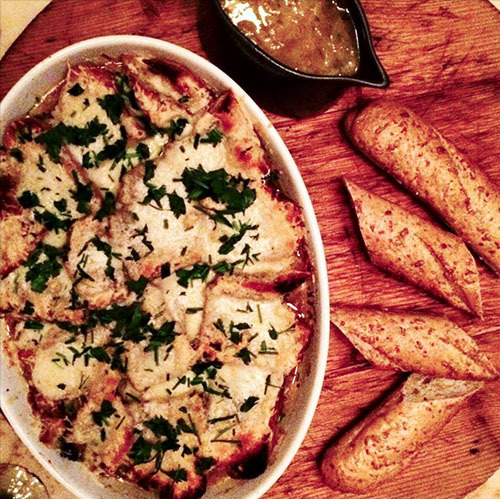 Broil until the cheese melts, serve in shallow bowls with crusty bread.